This morning in Huntington at 6:55AM it’s currently a chilly -10 degrees under clear skies. Winds are calm. Relative humidity is 83%, dewpoint -14, barometric pressure 30.19” and rising rapidly. We picked up 1.25” of fluffy snow yesterday evening and have 15” on the ground. Yesterday’s high was 22, and the overnight low was -10. Surface high pressure located over central Michigan will build into the region today. We’ll see partly sunny skies and chilly temperatures with highs only 7 to 13 above with northwest winds around 10 mph. Tonight should be mostly clear until midnight, then become partly cloudy. It’ll cold with with lows -10 below to -16 below zero with light and variable winds. Saturday should be mostly cloudy with a slight chance of snow showers in the afternoon as a clipper system slides through. Highs will be in the mid 20s with south winds 10 to 15 mph gusting up to 35 mph. Chance of snow is 20%. Saturday night should be cloudy with a 50% chance of snow showers. Lows will be around 16 with southwest winds 10 to 15 mph gusting up to 35 mph. Sunday’s looking partly sunny with a 50% chance of snow showers. Highs will be around 18 with northwest winds around 10 mph. Sunday night should be partly cloudy with lows around zero. Last year on this date we had a high of 43 and a a low of 31. 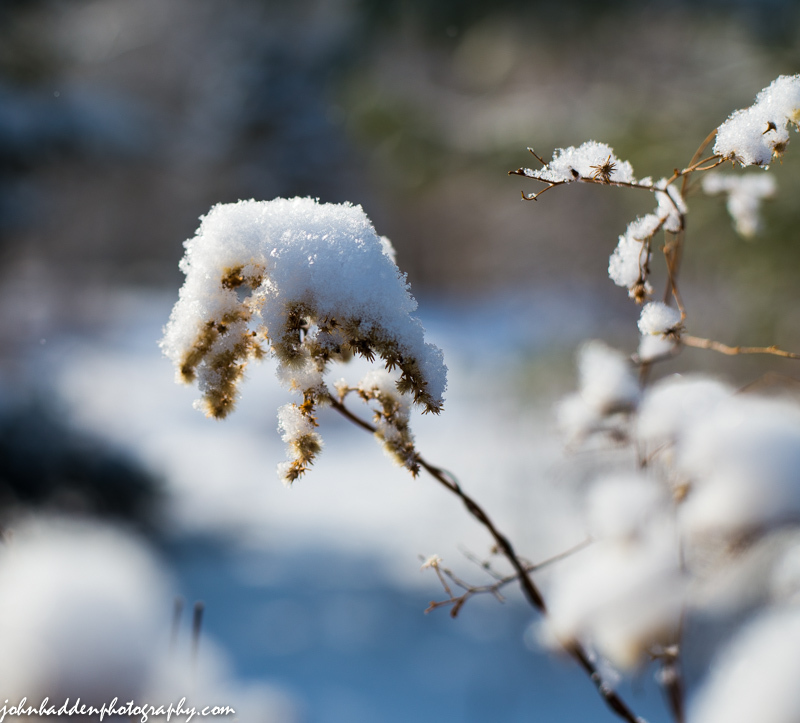 We picked up 0.25″ of rain and 0.50″ of snow and had 4″ of snow on the ground. The Moon a waning crescent, 28d 14h old with 1% illumination. Yup, that’s a robin sitting in our Korean mountain ash tree in our front yard just the other day. Not the best photo, but it was a bit cagey and wouldn’t let me too close. 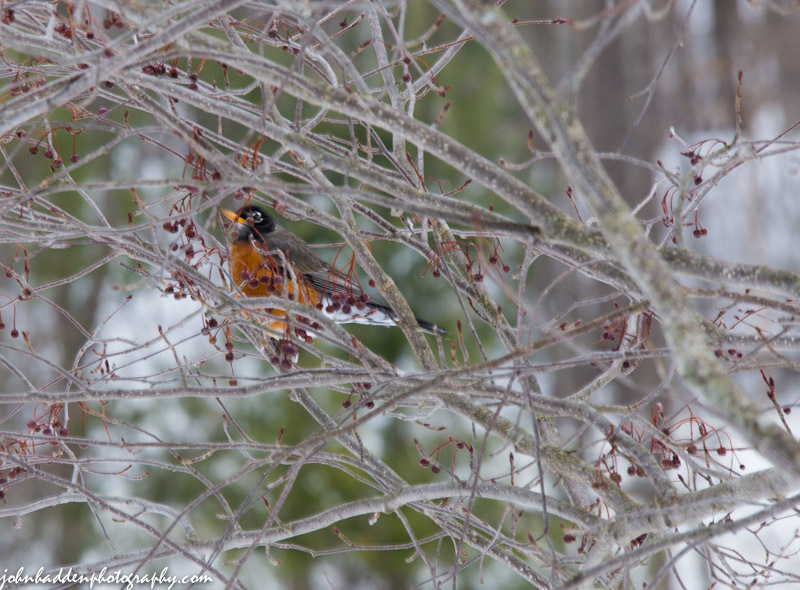 I’m guessing that this might be a Canadian robin, as they often “fly south” for the winter where “south” is Vermont. Years when there is abundant fruits in trees will often find them in our region over winter. Several years back, there was a banner year for mountain ash berries, and I saw dozens of robins in the trees up above 3000′ in the Greens. This morning in Huntington at 7:05AM it’s currently 4 degrees under cloudy skies. Winds are calm. Relative humidity is 80%, dewpoint -1, barometric pressure 29.65″ and dropping rapidly. We picked up just a dusting of snow in the past 24hrs and have 14″ on the ground. Yesterday’s high was 19, and the overnight low was -4. A potent disturbance in the jet stream winds aloft will combined with several weak surface troughs to produce snow showers and snow squalls across the region today along with continued unseasonably cold temperatures. We’ll see cloudy skies with a chance of snow showers this morning, then snow showers likely with possible snow squalls this afternoon. Snow may be heavy at times this afternoon with accumulation of a dusting to 2 inches. Highs will be around 18 with south winds 10 to 15 mph gusting up to 30 mph. Chance of snow is 70%. Tonight should be mostly cloudy with snow showers likely until midnight, then partly cloudy with a slight chance of snow showers after midnight. Total snow accumulation may be on the order of 2 to 4 inches. It’ll be cold tonight with lows around -2 below and west winds 15 to 20 mph. Chance of snow is 60%. Friday should be mostly sunny and continued chilly with highs only around 11 and northwest winds around 10 mph. Friday night should be partly cloudy and cold with lows around -2 below with light and variable winds. Saturday’s looking cloudy and slightly milder (though still 15 to 20 degrees below seasonal norms) with highs in the mid 20s and south winds 15 to 20 mph. Another shortwave trough will move through the region Saturday night bringing showers with little or no accumulation. Lows will be around 10 above. Chance of snow is 60%. Last year on this date we had a high of 39 and a low of 33. We had 4″ of snow on the ground. I was skiing up at Sleepy Hollow yesterday morning when I heard a long moaning “creak” from a tree as I passed by. 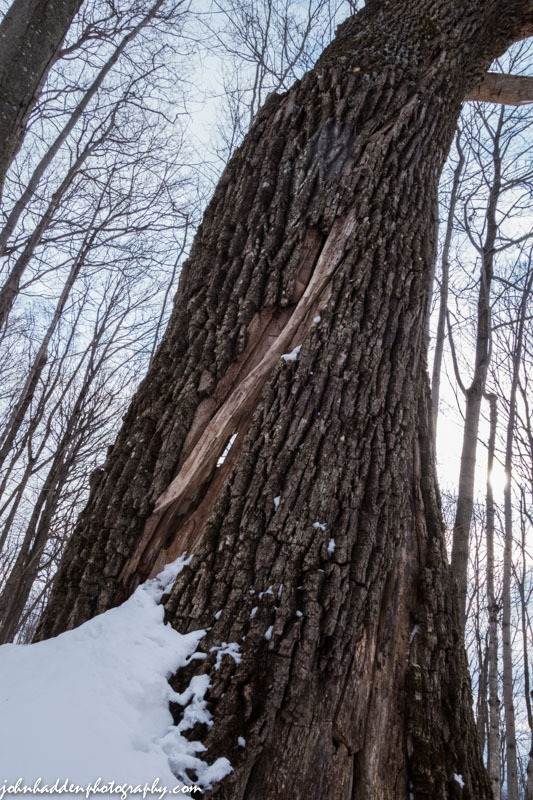 This large ash trees was on the side of the trail, and its trunk had been hollowed out over the years to the point where there was just about a third of it remaining. Cracks had formed in the remaining parts and with each gust of wind, the tree would creak and snap a bit. I don’t expect that tree to be standing for too much longer! Sony RX100 II, 10.4mm, ISO 160, f/11, 1/50″ exposure. This morning in Huntington at 6:30AM it’s currently 13 degrees under mostly cloudy skies. Winds are out of the northeast at 0-4 mph. Relative humidity is 82%, dewpoint 9, barometric pressure 29.78” and falling slowly. We picked up a 0.25” dusting of new snow in the past 24hrs and have 14” on the grounds. Yesterday’s high was 17, and the overnight low was 10. Below normal temperatures will be the rule straight through the weekend as reinforcing Arctic cold fronts will move across our region this morning and again during the midday and afternoon hours Thursday bringing scattered snow showers and some snow squalls. We’ll see cloudy skies today with snow showers likely mainly this morning. We could see accumulations of a dusting to 2 inches. Highs around 16. Southwest winds 15 to 20 mph with gusts up to 30 mph. Chance of snow is 70%. A brief ridge of high pressure will build in tonight bringing some clearing until midnight, then becoming cloudy. It’ll be colder with lows around -2 below and west winds 10 to 15 mph until midnight, becoming light and variable. Thursday will bring occasional snow showers with accumulations of a dusting to 2 inches. Highs will be around 17 with southwest winds 10 to 15 mph gusting up to 25 mph. Chance of snow is 90%. Thursday night should be mostly cloudy with a 40% chance of snow showers. It’ll be cold with lows around -2 below and west winds 15 to 20 mph. High pressure will swing through on Friday bridging partly sunny skies with highs around 10 above and northwest winds 10 to 15 mph. Friday night should be partly cloudy and cold with lows around zero. Last year on this date we had a high of 44 and a low of 28. We picked up 0.50″ of snow and had 5″ on the ground. The Moon is a waning crescent, 26d 14h old with 11% illumination. 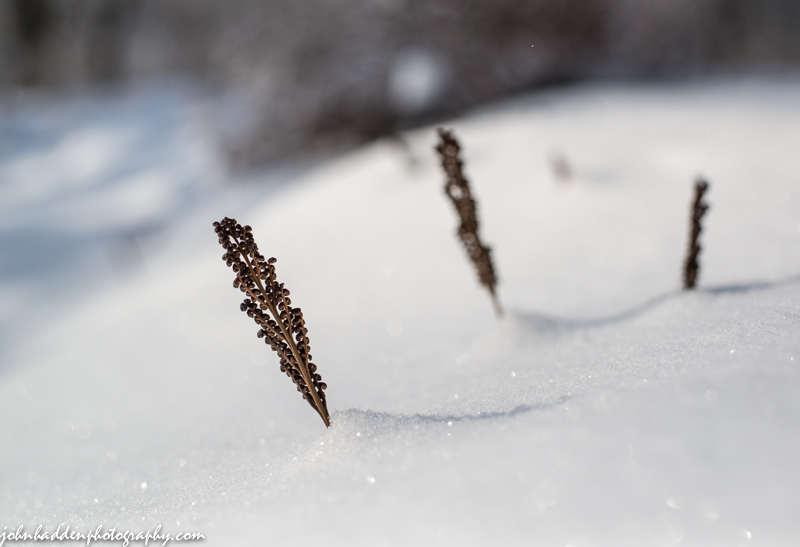 Fresh sugary snow almost covers these dried ferns down along Fargo Brook. Nikon D600, Nikon 50mm lens, ISO 100, f/3.5, 1/4000″ exposure. This morning in Huntington at 6:55AM it’s currently 8 degrees under mostly cloudy skies. We’ve got a bit of “snizzle” coming down. Winds are calm. Relative humidity is 90%, dewpoint 6, barometric pressure 29.96”. We picked up 1.5” of fluffy snow overnight and have 14.5” on the ground. Yesterday’s high was 27, and the overnight low was 7. We’re in for a cold next few days and another shot of chilly Arctic air moves into the region. We’ll see cloudy skies with scattered snow showers today. Highs will be around 15 with northwest winds around 10 mph. Chance of snow is 50%. Tonight should be cloudy with a chance of snow showers, mainly after midnight. Lows will be around 5 above with west winds around 10 mph, becoming southerly after midnight. Chance of snow is 30%. Wednesday should be cloudy with a 50% chance of snow showers as a shortwave trough and associated cold front swing through during the day. Highs will be 13 to 19 with southwest winds 10 to 15 mph, becoming westerly 15 to 20 mph in the afternoon. Wednesday night should be partly cloudy with lows around 1 above and southwest winds 10 to 15 mph. Thursday should be cloudy with a 50% chance of snow showers as another trough moves through. Highs will be 15 to 21 with south winds 10 to 15 mph gusting up to 30 mph. Thursday night should be partly cloudy with lows 5 below to zero. Last year on this date we had a high of 34 and a low of 28. We picked up 0.03″ of rain and 0.75″ of snow and had 5″ on the ground. The Moon is a waning crescent, 25d 14h old with 20% illumination. A dusting of fresh snow perks things right up! Nikon D600, Nikon 50mm lens, ISO 100, f/3.5, 1/1250″ exposure. 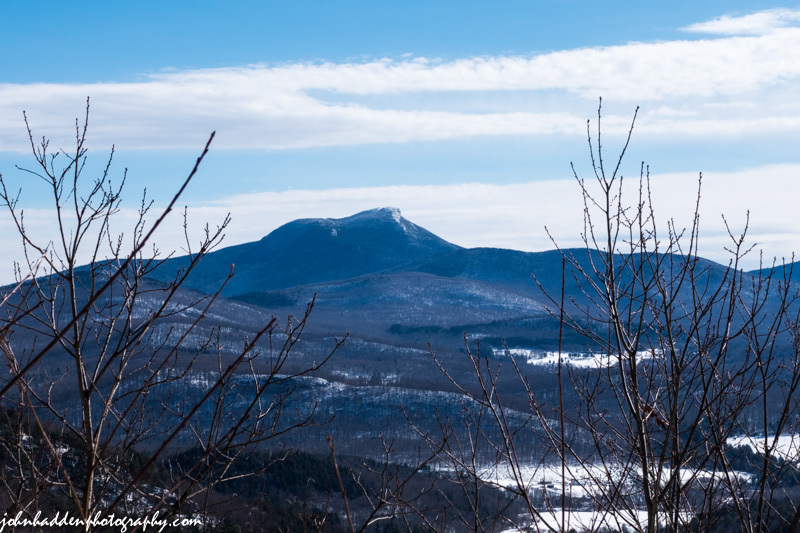 Camel’s Hump from the Butternut cabin porch as Sleepy Hollow yesterday morning. This morning in Huntington at 7:15AM it’s currently 20 degrees under mostly cloudy skies. Winds are calm. Relative humidity is 77%, dewpoint 14, barometric pressure 29.78″. We have 13.5″ of snow on the ground. Yesterday’s high was a balmy 45, and the overnight low was 20. As an upper trough slides into the region, conditions for today will feature scattered snow showers — most numerous across the higher terrain — and temperatures slowly falling through the day. We’ll see cloudy skies with scattered snow showers. We may see 1-3″ of snow in the mountains. Highs will be in the lower 20s with west winds 10 to 15 mph gusting up to 25 mph. Chance of snow is 50%. Tonight should be cloudy with a 20% chance of snow showers. Lows will be around 9 above with west winds 10 to 15 mph. Tuesday should be cloudy with a 20% chance of snow showers. Highs will be around 20 with west winds around 10 mph. Tuesday night should be mostly cloudy with lows around 6 above and southwest winds around 10 mph. Wednesday should be mostly cloudy with a 50% chance of snow showers as another weak disturbance slides along the aforementioned trough. Highs will be around 19 with southwest winds 10 to 15 mph gusting up to 25 mph. Wednesday night should be partly cloudy and cold with lows around zero. Last year on this date we had a high of 36 and a low of 30. We picked up 0.03″ of rain and 0.75″ of snow and had 5″ of snow on the ground. Burlington norms for this date are highs of 33°F 15°F. The Moon is a waning crescent, 24d 14h old with 30% illumination. 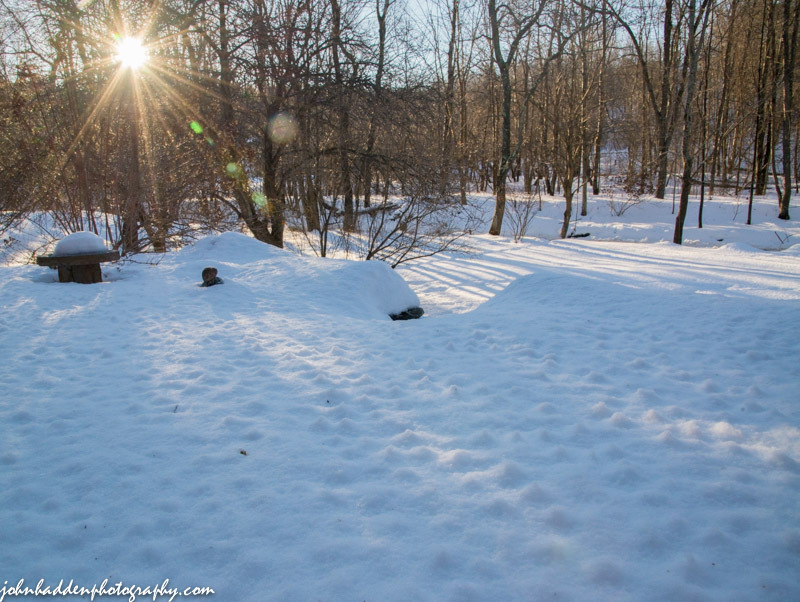 Sony RX100 II, 37mm, ISO 160, f/11, 1/320″ exposure. This morning in Huntington at 7:50AM it’s currently a balmy 36 degrees under mostly cloudy skies. Winds are out of the west at 2-5 mph. Relative humidity is 59%, dewpoint 22, barometric pressure 29.90″. Snowpack is 13.75″. Yesterday’s high was 44, and the overnight low was 22. We’ll enjoy one more day of above normal temperatures today courtesy of a modest southwesterly flow associated with a broad upper trough over the northern Continental U.S. and a closed upper low over the James Bay region. We’ll see partly sunny skies with a chance of snow showers this morning. Highs will be in the upper 30s with southwest winds 10 to 15 mph. Chance of snow is 20%. Tonight should be partly cloudy with a slight chance of snow showers after midnight. Lows will be around 15 with west winds around 10 mph. Chance of snow is 20%. Monday should be cloudy with scattered snow showers mainly in the afternoon as weak shortwave energy slides along the trough and through our region. Highs will be around 20 with west winds 10 to 15 mph gusting up to 25 mph. Chance of snow is 40%. Monday night should be cloudy and cooler with lows around 6 above and northwest winds 10 to 15 mph. Tuesday’s looking mostly cloudy with highs around 18 and west winds around 10 mph. Tuesday night should be mostly cloudy with lows 5 to 10 above. Last year on this date we had a high of 37 and a low of 26. We had 4.5″ of snow on the ground. The Moon is a waning crescent, 23d 15h old with 41% illumination. We have several red squirrels in residence here, attracted by the bird feeder. This time of year they’re starting to chase each other. 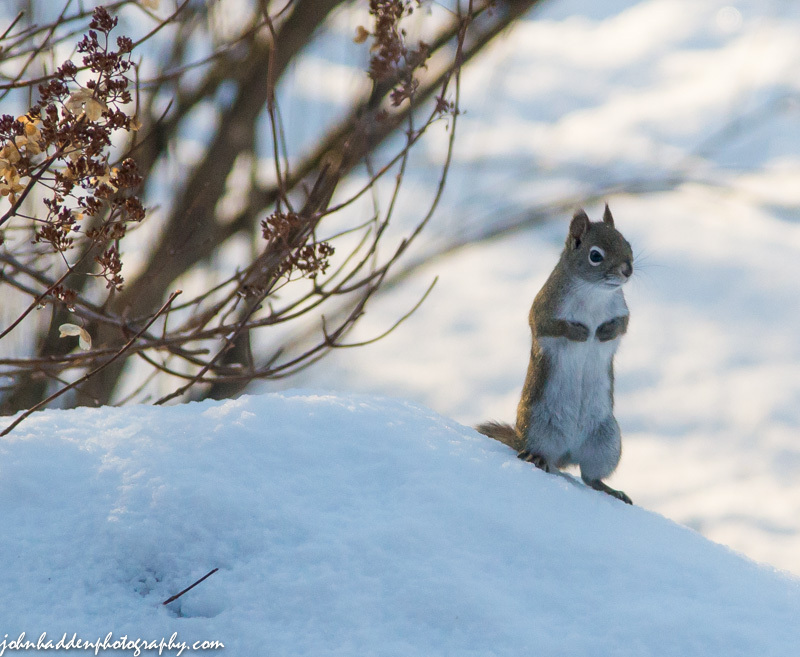 Just after taking this shot, another squirrel popped up behind this one, and off they went! Nikon D600, Nikon 24-120mm lens @ 120mm, ISO 1250, f/4.5, 1/2500″ exposure. This morning in Huntington at 7:35AM it’s currently 34 degrees under clears skies. Winds are out of the west at 0-3 mph. Relative humidity is 67%, dewpoint 24, barometric pressure 29.82” and rising slowly. We picked up 0.50” of rain in the past 24hrs and an 1/8” layer of frozen sleet. Snowpack is down to 14.5” with a half-inch breakable crust (better then I expected actually…) Yesterday’s high was 43, and the overnight low was 30. It’ll be a generally quiet day across the region today as we’ll be in between the departing cold front to our east and an approaching upper trough to our west. We’ll see mostly sunny skies and above normal temperatures with highs in the lower 40s courtesy of a strong southwest airflow blowing 15 to 20 mph with gusts up to 35 mph. Tonight should be mostly clear until midnight, then become partly cloudy. Lows will be in the mid 20s with southwest winds 10 to 15 mph. Sunday should be partly sunny and mild with highs in the mid 30s and southwest winds around 10 mph. Sunday night should be partly cloudy with lows around 14 and west winds 10 to 15 mph. Monday’s looking mostly cloudy and cooler with highs around 19 and west winds 10 to 15 mph. Monday night should b mostly cloudy and cool with lows around 5 above. Last year on this date we had a high of 35 and a low of 7. We picked up 0.75″ of new snow and had 6″ on the ground. The Moon is in its last quarter, 22d 15h old with 52% illumination. With a half-inch of rain yesterday, the snowpack took a hit (though not as bad is it could have been!) The crusty snow on our back patio has in interesting conical dappled surface this morning. Nikon D600, Nikon 24-120mm lens @ 24mm, ISO 1250, f/14, 1/400″ exposure.